Current Research on Bisexuality is an important resource on recent psychological and sociological findings in bisexual studies. The authors provide research findings and case studies that add to our understanding of bisexual identity, bisexuality and relationships, bisexuality and ethnicity, and attitudes toward bisexual people. 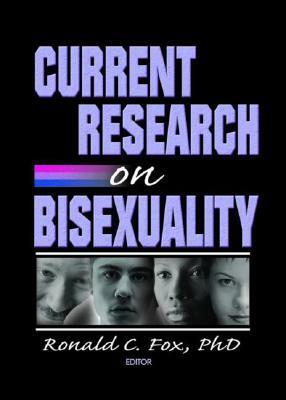 This book examines research findings, literaCurrent Research on Bisexuality is an important resource on recent psychological and sociological findings in bisexual studies. The authors provide research findings and case studies that add to our understanding of bisexual identity, bisexuality and relationships, bisexuality and ethnicity, and attitudes toward bisexual people. This book examines research findings, literature reviews, and a wealth of resources that currently exist on bisexuality and bisexual issues. This book will bring you up to date on: bisexual identity development bisexuality in college students cross-orientation friendships of bisexual women bisexual married women and men--and their spouses bisexuality and heterosexually married couples monogamous as well as open bisexual relationships the interrelationship of bisexuality, race, and ethnicity attitudes toward bisexual women and bisexual men Current Research on Bisexuality also contains a comprehensive reader's guide to the current social science literature about bisexuality. This bibliography brings together a wide range of nonfiction books, journal articles, book chapters, theses, and dissertations on bisexuality with a focus in the theoretical, research clinical, and community perspectives that have that have developed in the last twenty years. This reading list is essential for students, educators, researchers, and practitioners in psychology, counseling, social work, psychiatry, education, sociology, and anthropology. Current Research on Bisexuality provides new knowledge of the life experiences of bisexual people. With this book, you'll find a basis for further research and education about bisexuality in the greater context of ongoing research, education, and advocacy regarding lesbian, gay, bisexual, and transgender issues.